One of our specialties at Envirotek is providing grinder pump repair services in Missouri. We service Springfield, Nixa, Ozark, Branson and Kimberling City. The most common issues we see with grinder pumps are related to the installation. Other problems are often related to improper pump selection. 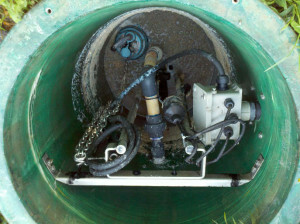 A grinder pump incorporates rotating cutters which reduce sewage particles. They have the capability to grind up items not normally found in sewage such as feminine sanitary napkins and dish rags. These larger items are ground into smaller particles before entering the pump chamber and discharge piping. Most maintenance we provide involves the control panel and electrical components. If you noticed that red flashing light or buzzer alarm going off we can help! Envirotek Systems specializes in quickly diagnosing your grinder pump alarm needs. You might say “but it’s after midnight, I don’t want to bother anyone at this hour”. Don’t be shy. Call us. It is better for us to see the condition as soon as possible. Often it is a simple fix. Some situations require pump replacement. Others require electrical control components or maintenance. Whether the reason for your sewer alarm condition is electrical, mechanical or otherwise, we know the right solution. Did you know there is a long lasting grinder pump repair system available? One that eliminates all of the common problems associated with other systems? We have developed the Visi-Pump system that utilizes industrial duty motors and controls. These systems eliminate the common problems associated with standard residential grinder pumps. Effective solutions to grinder pump and control panels require a service provider who specializes in these units. Envirotek Systems has your solution.